From time to time, a credit card offer comes along that speaks to the hearts of those most credit-worthy and who also appreciate a generous rewards program. These days, that credit card offer is found in the Visa Black Card. So exclusive, it’s been featured in the New York Post and Forbes, among others. This week, we take a look at the limited membership credit card and its many benefits. Is it the right offer for you? 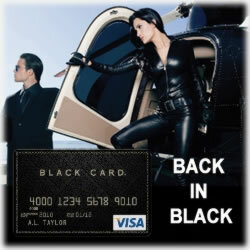 The marketing efforts associated with this credit card include a “Back to Black” campaign. It’s carefully targeted and is reserved only to those with impeccable credit scores. As many credit card companies are doing these days to lure new customers, the Visa Black offers its own 15 month 0% APR for purchases. The intro rate is not applicable to cash advances; however, you can transfer balances from your other credit cards at the intro rate. This high credit limit card allows those on the higher end of the credit card scoring table to shop with few, if any, considerations to how much credit is available on their credit card. It’s certainly comparable to other credit cards in this category, and some say it offers more than its competitors. As mentioned, the rewards are numerous and the perks irresistible. You’ll enjoy a 24 hour concierge service, which is something that’s not often a part of other credit card offers. These top of the line booking services are a huge benefit when you’re traveling in unfamiliar cities. You’ll have access to the most sought after tickets for ball games to Broadway. Further, because of its limited membership, Visa is better able to gauge its customers buying habits. This allows for a very concise and exclusive rewards program, along with luxury gifts for cardholders. Visa searches for those brands that its customers most often reach for and then offers great discounts based on its findings. As a cardholder, you’ll also enjoy travel lounge priority pass access, which is already in more than 600 airports worldwide, and you always travel with no worries of blackouts or other restrictions. As far as your cash back, you’ll earn 1% on all eligible transactions. You’ll also enjoy all of the safety mechanisms built into the Visa network, including zero fraud liability, online account management and paperless statements (if you wish). Other benefits include 24 hour customer service, global travel insurance, auto rental insurance and reimbursements for flight delays, including up to a $300 reimbursement if your flight is delayed 12 hours or more. This offsets expenses associated with having to book a hotel due to a canceled flight as well as meals and other incidentals. Of course, these are just a few of the many benefits. You can learn more by carefully reviewing the offer, as well as the terms and conditions associated with the offer. While it’s hard to find any reason to rethink the Visa Black credit card, there is a $495 annual fee. While this might not be a strong reason for many folks, in an effort of full disclosure, it’s important this is included in the review. That said, the many benefits will offset the annual fee, especially considering the rising costs of airline travel. Other fees include a late fee of $39, an over the limit fee of $39 and if your payment is returned to Visa for insufficient funds, you’ll pay a $29 fee. If you travel often and have a strong credit score and history, odds are, you’ll qualify for the Visa Black Card. It’s targeted at those who live a very exclusive lifestyle and all of the perks that come with that way of living. Visa has met the challenge and as a result, the Visa Black is consistently ranked high consumer satisfaction surveys. The security measures, the twenty four hour service, whether it’s via concierge or customer service, as well as the rewards program, make this a fine offer that’s most certainly deserving of your consideration. As mentioned, be sure to read the terms and conditions and don’t forget the annual fee – odds are, you’ll discover it’s a very small price to pay for such a benefits-rich credit card offer. Just got this black card visa, had all 3 of my fico scores well over 800+, so i had no problem. but i do think the 60,000 miles cap is BS.. since you have to pay $495 a year for the card. the black credit card is all about prestige. It’s not really for the income bracket that would complain about the price! when you make over $250,000 annually, the $40 a month annual fee of the visa black is nothing. But the status; now that’s something!